I' have done some tests with Caché and Apache Zeppelin. I want to share my experince to use both systems together. I'll try to describe all steps that are required to config Zeppelin to connect to Caché. 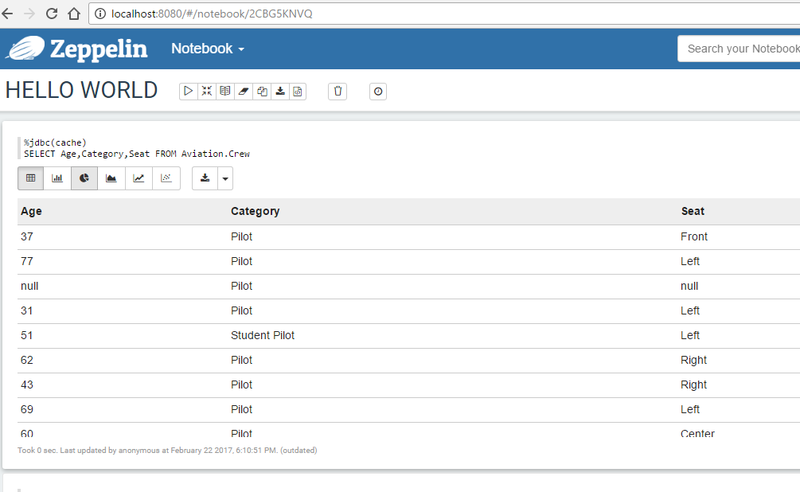 "A web-based notebook that enables interactive data analytics. You can make beautiful data-driven, interactive and collaborative documents with SQL, Scala and more. Apache Zeppelin interpreter concept allows any language/data-processing-backend to be plugged into Zeppelin. Currently Apache Zeppelin supports many interpreters such as Apache Spark, Python, JDBC, Markdown and Shell"
Well done! Zeppelin is now up and running! Now let us introduce Caché. The next steps describe how to create a jdbc connection to a Caché Namespace. 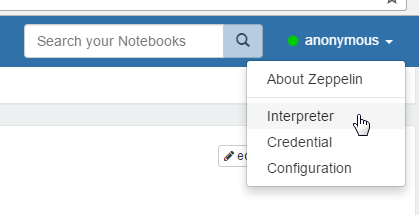 Navigate to the menu item "anonymouse" -> "Interpreter" and scroll down to the "jdbc" section. 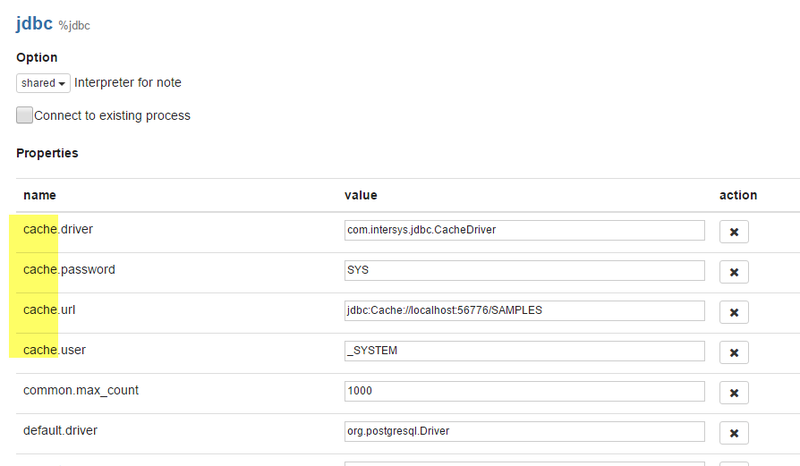 Add the path to the Caché JDBC driver in the "Dependencies". This is located at the end of jdbc section. Great! All preparations are done, now let us use Zepplin and Caché. Follow these steps to create a first Notebook to query and visualize some Caché data. By typing %jdbc(cache) you inform zeppelin what data source you want to query. In detail: The %jdbc keyword lets zeppelin call the jdbc interpreter and the cache routes the query to the Caché connection. If you want to use more connections to Caché e.g. another namespace you have to create more entries in the jdbc section you've done before. The prefix of the entries are the connection name. Have you perhaps also looked into creating a more advanced interpreter, rather than just leveraging the JDBC one? I know that's probably a significantly more elaborate thing to do, but a notebook-style interface for well-documented scripting would nicely complement the application development focus of Atelier / Studio. But! ... I have no idea which functionality would be helpful in an more advanced Caché interpreter. Can you give me a hint on what features do you think, please? It should be very easy to implement something like a simple code completion with Caché Keywords to use in a notebook. But at this time I think all is limited to the JDBC interface, and with that to SQL. Would be really great if we could use also COS to fetch data... !? yes, the two-word feature called "executing COS" would probably be quite a step up. It was more a loose idea than something I've researched thoroughly, but maybe the authors of the Caché Web Terminal have some clues on how the connectivity should work (JDBC won't pull it). 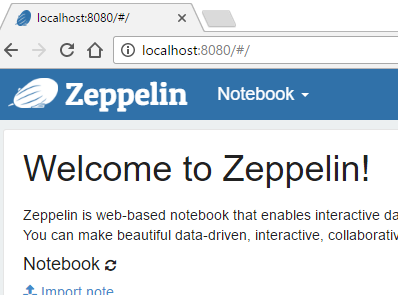 I'll created a fork on github (https://github.com/andreas5588/zeppelin) for Apache Zeppelin. My plan is to create a Caché Interpreter (first JDBC based) to learn and unterstand the architecture of Zeppelin. 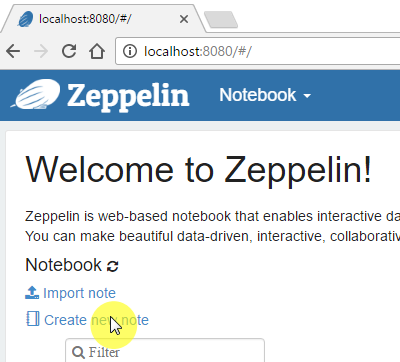 Here's an article on how to write your own zeppelin interpriner.